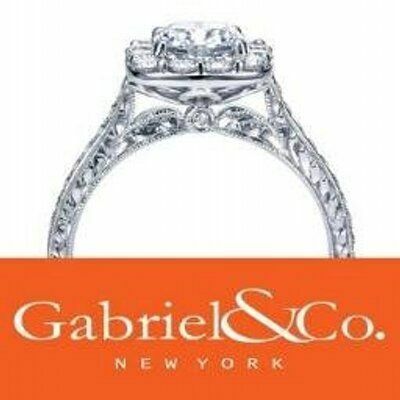 Gabriel & Co. has earned the reputation as being passionate, dependable, and artistic designers, creators and manufacturers. Our extensive line of timeless pieces encompasses classic and fashion-forward design, ultimately bringing together impeccable artistry with enduring technology, perfect for every unforgettable moment. Gabriel & Co White & Rose Gold 14 Karat Diamond Halo Engagement Ring. Size 6.5. Lady's White 14 Karat Antiqued Cathedral Engagement Ring Size 6.5 With 0.95Ct Diamonds. Lady's White 14 Karat Gold Channel Set Wedding Band Size 6 With 24 Round Diamonds. Lady's White 14 Karat Gold Wedding Band Size 7 With 28 Round Diamonds. Lady's White 14 Karat Halo Engagement Ring Size 6.5 With Diamonds. Lady's Yellow 14 Karat Engraved Solitaire Engagement Ring Size 7.25 With .46Ct Diamond.